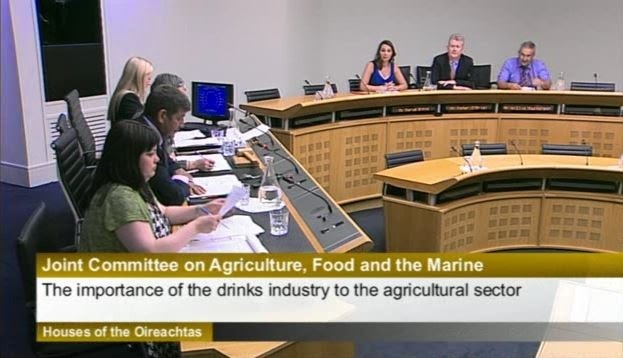 A posse of drinks industry heroes recently met the Joint Committee on Agriculture and Food in Leinster House. Marie Byrne of the Dublin Whiskey Company brought the entrepreneurial vibrancy that suffuses Irish distilling at the moment; Willie Masterson, malted barley grower, told of farmers' readiness to supply the extra grain that the phenomenal growth in Irish whiskey will require; and Peter O'Brien, chairman of the Drinks Industry Group of Ireland and corporate relations director for Diageo, explained the enormous ongoing contribution of drinks production to the Irish economy. You would think this would be a rather convivial encounter. "You want to generate how many jobs and attract how many extra tourists to the country? That's marvellous! What can your representatives in government do to help?" But no. The visitors were treated rudely and condescendingly by the committee members, none of whom seemed prepared to begin an intelligent and constructive partnership. Éamon Ó Cuív set the tone by decrying the "violence and misery" that the demon booze has visited upon us, and the other five speakers trotted out sanctimonious variations on the same theme. Even Senator Mary Ann O'Brien disappointed. She is not a career politician but a businessperson who built a successful export-oriented chocolate company. I had expected her to support fellow luxury goods entrepreneurs instead of throwing them under the bus. "There is nothing wrong with an Irish person enjoying an alcoholic drink. It is a pleasure we share with every other society on the planet, a part of our common humanity and something we have enjoyed for millennia. The state should not punish this activity." "Changing the binge drinking culture is our job, not the job of the drinks industry. We were elected to lead, we are paid to lead, we will lead." "We have generated a lot of noise about alcohol abuse but while pretending to give a damn we actually made alcohol of indifferent quality widely available in petrol stations and late-night convenience stores, and in bulk at low cost from supermarkets. We sabotaged sensible ideas like café-bar licensing and the introduction of smaller 'schooner' glasses in pubs." "We are closing the Daíl bar. Nobody should be drinking in the workplace. We will set a more mature example." "The recent interest in craft brewing and distilling is a great opportunity to move the focus of drinking away from quantity towards quality." "We will also encourage, via Bord Bia, the matching of Irish foods with Irish drinks, encouraging a healthier pattern of consumption." "We will subtly shift an unfortunate perceived link abroad - particularly in the the US - between Irishness and alcohol abuse, towards an association between Ireland and the world's best craft spirits, ciders and beers." "Bottles of fine whiskey will be ambassadors for Irish quality and craft in every nook and cranny of the globe." "We will foster a pride in and appreciation of our native spirits at home by not pricing them out of reach of ordinary folks. The new distilleries need a thriving local market to bootstrap their growth and gain valuable consumer feedback." "VAT of 23% on a bottle of whiskey is already an excessive grab from people's after-tax income. Adding a further €14.66 in excise duty (including VAT on that duty!) is arbitrary, punitive and unbecoming of a democracy." "We will not discourage whiskey tourism - so successful in Scotland - by making great spirits but taxing them so they can't be affordably sampled in their own country." "We can phase out archaic taxes like excise duty if we ruthlessly eliminate wasteful public spending due to over-administration and corruption." "If alcohol abuse imposes a cost on society we will seek to recover those costs more directly from those who abuse alcohol. Spreading the cost across all drinkers is not a disincentive." "We wish the new brewers and distillers the best of success. The country is behind you. Slaínte!"